2 24 ms 23 ms 23 ms 99-101-60-3.lightspeed.jcvlfl.sbcglobal.net [99. According to your traceroute output, it's actually going from Miami, FL to Houston, TX to Dallas, TX and then into Chicago where it's routed around a bit to the final server. I made a small visual tracert program for fun not too long ago. Now seems like a great time to show it off. No, the green cross isn't where I live. Physical location isn't always 100% accurate when it comes to IP addresses. Another one of HiRez's famous cases of "good enough". I've been battling this same issue with a very ignorant and foolish HiRez employee. His most recent email involved some config issues about SMITE. I reply that we aren't even talking about Smite. He closes my support ticket in less than 48 hours. Nice job of tucking your tail and running when I caught you! I use to use that prog all the time when I was squeezing every bit of badnwidth from my ISP! Awesome program and thanks for taking an abstract tool (For most people, tracert output is matrix code) and making it make sense! I encourage the community to use this tool to see how f'd up the routing is to the HiRez servers. HiRez pays to have their servers hosted and QOS is part of that hosting agreement. They should have incident/trouble tickets opened each time a routing/latency issue is found where it's not on the user's end (again, the tool will demonstrate that). You do need to be careful when using things like this. GeoIP services are often inaccurate. If the physical location trace looks really bizarre, then it's probably wrong. Take Limyc's screenshot there for example. It bounces from one coast to another before landing back in Illinois. If you look at the reverse lookups (hostname in the picture) though, you will see that it just goes from Michigan to Illionois and not all over the country. Router names can be incorrect at times, but they seem reasonable in this case. Looking at the source code, the tool relies on the IPInfoDB dataset which comes from IP2Location. They place me in New Hampshire instead of Texas. The MaxMind database does a better job, but it's not completely accurate either. GeoIP services have to rely on several heuristics which look at WHOIS data, router names, known routes, etc... and try to pick the most logical one. The BGP tables can get bad entries in them from time to time and send you around the country, but that typically gets propagated out fairly quickly. If GeoIP tools say you're bouncing around the globe, you may want to look at it a bit closer to see if it's actually true. 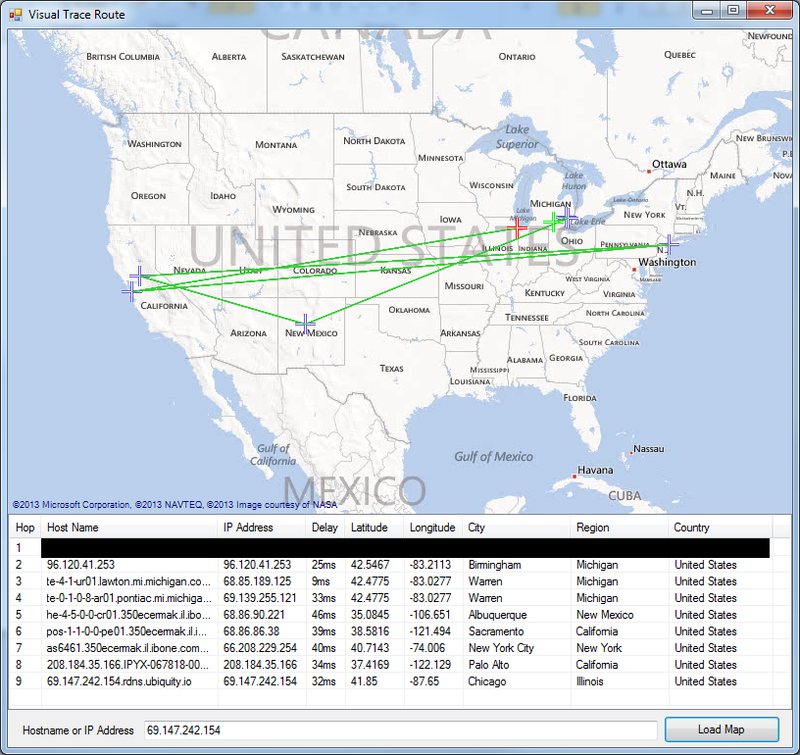 Take GeoIP data with a grain of salt.